From time to time, I like to pass on some things that I've found on the worldwide blog-o-sphere that I feel you must read. If you're not checking out Joe Posnanski's blog, you should be. He's a columnnist for the Kansas City Royals and his blog is fantastic. Here's a great post he did recently on what makes Tiger Woods - and other transcendent athletes - tick. Our lights-out 7th inning guy from last year is officially AWOL. Hideki Okajima once again served up a fat meatball for a key hit - this time to Astros' infielder Mark Loretta yesterday to help Houston take two of three from the Sox. Okajima has been downright hideous this year, especially when he comes in with runners on base. Since June 4, Okajima has given up 15 hits and six earned runs in just 7 2/3 innings of work. Something tells me Theo will be looking to shore up the bullpen at the trading deadline. At any rate, the Sox lose to the Astros 3-2 yesterday, wasting yet another solid pitching performance from Josh Beckett. Manny went deep late in the game to tie it at 2, but the big story was the number of men left on base. Jason Varitek, by the way, is 12 for his last 91. Ouch. And on a side note, Dustin Pedroia is absolutely on fire right now. He must feel like he's in the Route 1 batting cages every time he comes up these days. Not exactly the wave of momentum the Sox need as they wake up this morning in lovely St. Petersburg, Florida, home of the first-place Tampa Bay Rays. While the Sox' bullpen was busy imploding in Houston, the for-real Rays took 2 of 3 from Pittsburgh and are riding high into this series, during which they'll start James Shields, Matt Garza and Scott Kazmir. They're playing with oodles of confidence, while the Sox are just shuffling along, trying to stay afloat. This series could get ugly. One thing that will be interesting is whether the fans show up for this series, and I'm not talking about the Red Sox transplants. If you're a baseball fan in the Tampa-St. Pete area and you're not supporting this team, shame on you. They have a legitimate chance to do some postseason damage, especially if they trade a few chits in July for another stud pitcher and maybe a big hitter. Of course, the big back-story to this series is the brawl the two teams got into earlier this month. Coco is serving his suspension, so the prime instigator won't be around. Still, it will be interesting to see what level of warnings are issued prior to the game and whether the Sox abide by them. I mentioned in a recent post that I don't think you'll see any payback, but I just looked at the Sox' schedule and Tampa doesn't come back to Fenway until early September. That's a long time to let things simmer. So maybe we will see something. If I'm Jonny Gomes or Carl Crawford, I'm stepping into the batter's box feeling a little uneasy. Apologies for the little mini-vacation around here. Call it a prolonged case of Celtic euphoria, combined with catching up on some sleep after the endurance test of watching the 9 p.m. start times on the East Coast. Who was the brilliant one who thought that was a great idea? All the green and white confetti is gone from last week's parade, the draft was held this week, and the big question for hoops fans around here now is whether the Celtics will be able to sign free agent James Posey, who came up huge in the Finals. In other words, it's time to think about next year for the Celts, which means it's time to think about this year and the (ho-hum) 2-time World Champion Boston Red Sox. As they hit the official mid-point of the season tonight, the amazing thing about the Red Sox so far in 2008 has been their ability to stay on top of the division despite suffering some key injuries. The most suprising thing by far has been the play of the Tampa Bay Rays, who have solidified themselves as a serious postseason contender on the backs of some extraordinarily talented youngsters. The Sox entered tonight's game with the Astros with a 1/2 game lead over the Rays, which is all the more impressive when you realize the rash of adversity we've dealt with so far this year. Schilling out for the season. 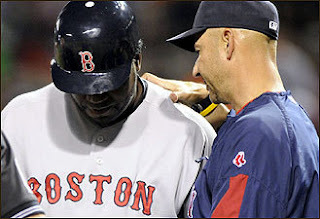 Papi and Dice-K out for extended periods. A hamstrug Manny playing at half-speed, which when you think about it, is really half-half speed. But instead of fading, the Sox have shown the incredibe organizational depth that young Theo Epstein promised during his introductory press conference in 2002. J.D. Drew has picked up the slack big-time on offense, and is in line for AL Player of the Month honors after slugging his 11th homer in June last night in Houston. If you're keeping score at home, he hit 11 all of last year. On the mound, Justin Masterson has supplied some spackle, Jon Lester has shown why Theo was so reluctant to trade him, and the Sox seem to have settled into a good bullpen rotation after some shaky periods. Biggest surprise in the pen has been David Aardsma. Chris Smith has been solid, as have Manny Delcarmen and Craig Hansen. 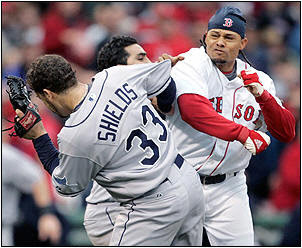 As you no doubt remember, there were some fisticuffs the last time the Sox and Rays met at Fenway - when Coco Crisp charged James Shields after getting beaned and an all-out brawl ensued. Multiple players on both sides received suspensions. Coco just had his suspension reduced from 7 games to 5, and not surprisingly, he'll be out for the Rays series coming up this week. As our own Nuke LaLoosh - Jonathan Papelbon put it - the Soxwon't soon forget the sight of several Rays (hello Jonny Gomes) pounding away on a restrained Coco. My best guess is you won't see any hostilities this coming week at the Trop, but you'll see something the next time they meet at Fenway. There's too much focus on the brawl right now and what may happen next so the umps will be extra-aggressive. It wil be interesting, though, to see if Jonny Gomes steps foot in the batter's box. If I'm a Sox pitcher, it would be very hard to abide by an ump's warning in favor of plunking that derelict in the earhole. The bottom line with the Sox' first half is all things considered, we're in a pretty good place. And the team should really take off with a healthy Papi back and a healthier Manny. Idle thought: Anyone heard from Roger Clemens lately? Anyone Seen the Lakers? Anyone? Bunch of Tall, Wussy-Looking Guys in Purple and Gold? 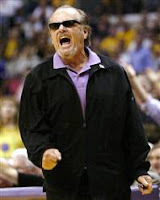 I guess that kid's t-shirt rubbed off on the Lakers, because boy are they laying a huge egg. P.J. Brown just hit two free throws to put the Celtics up by 31 points with just over 5 minutes left in the third quarter. The Lakers look listless, the Celtics look hungry and possessed. Barring a major letdown, it's going to be a special night in Boston. KG has risen to the occasion big time in this one. Best highlight was a sequence toward the end of the first half when he hit a ludicrous falling away shot after being fouled, blocked a Laker at the other end, and then made a sweet pass to Perkins for another bucket. He's been diving for loose balls all night long, and Rondo is back to his ball-hawking ways. He's got six steals and we're not even through the third quarter. If I was a true blogger, I'd drive the 20 minutes south to the Garden and get some street reaction. You're just going to have to settle for some couch reaction. Well, the Celts ended the first quarter tonight with a 24-20 lead and with P.J. Brown, Eddie House, James Posey and Leon Powe on the floor. KG had 10 points on 5 for 7 shooting, it was nice to have Perkins in there, and Ray Allen had to leave after he got poked in the eye by Lamar Odom. Second quarter is just underway and both KG and Allen are on the bench. They should be plenty rested when Doc calls their numbers. At least it better be. We don't need no stinking Game 7 again. Uh-uh. I'd describe the mood in Boston as confident but cautious. There are so many little things going against the C's - Rondo not 100%, Perkins probably out, Ray Allen dealing with a family issue, the team's plane being delayed yesterday in LA for several hours, etc. On the other hand, I think this team has shown that it's deep enough to beat the Lakers without Rondo/Perk, and I keep going back to the fact that they were one Kobe poke away from beating them on their home floor in a must-win game. Either way, it's exciting to have a chance to win the trophy at the Garden, and I can't wait to watch the scene unfold should the night go our way. My one little prediction for tonight is that KG absolutely goes off. With all the focus on the Celtics lately - and rightfully so - we haven't talked much about the Red Sox. They're into their intraleague schedule, having played a weekend series in Cincinnati and now they're in Philly. Taking 2 of 3 from the Reds - including a win against their young ace Edinson Volquez - was impressive, especially without Papi and Manny in the lineup. I didn't get to see much of the game last night, but it looked like the Phillies laid the lumber on Bartolo Colon. Some people are speculating that this could be a preview of a big October matchup. The other baseball story right now concerns the age-old debate over AL pitchers batting in these NL games. Yanks' starter Chien Ming Wang hurt his foot running the bases the other night, and could be out until September. And as you might suspect, Hank Steinbrenner is up in arms about it. It's a worthy debate. I mean, if you go to a game, would you rather see a rumpled Bartolo Colon strike out four times, or would you rather see another guy in the lineup who actually hits for a living? It's a no-brainer to me, baseball purists be damned. For a major professional sports league to have two different sets of rules is completely inane. I guess the other thing to talk about - and what can be said anymore? - is the incredible Tiger Woods. And I should add the amazing Rocco Mediate. The two played in a playoff yesterday for the U.S. Open championship, and the older, bad-backed Rocco gave Tiger everything he could handle. In the end, Woods wins his 14th major and on the whole, it's a tournament that we'll remember for a long, long time. 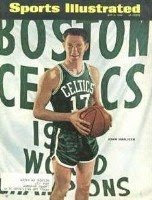 Here's hoping Green 17 means more than just John Havlicek's retired number after tonight. If not, things could get a little, ah, skittish around here. Every now and then, something happens in this crazy Wide World of Sports of ours that makes us veer away from the normal topics. Today is one of those days. Thanks to West Coast golf, I was able to watch the last nine holes of the U.S. Open at Torrey Pines (San Diego) last night, and what a fortuitous decision it was. It started when I was at the gym, watching Tiger - hobbling due to a recent knee surgery - lining up a seemingly impossible two-putt from a mile away from the hole. Of course, he drilled it right in the middle of the cup for an eagle, prompting yours truly to let out a 'woo-hoo' loud enough for the whole gym to hear. But Tiger wasn't finished. As he limped up the 18th fairway, the fans let him know how much they appreciated the effort - and he rewarded them with yet another eagle putt. In the span of six holes, he went from even par to 3 under. All on a bad wheel. Absolutely amazing. Happy Dad's Day to all, especially the new Dad down there in Sarasota. More than 24 hours later, it's still awfully damn sweet isn't it? The Celtics staged one of the greatest comebacks in NBA Finals history Thursday night, storming back from 24 down to beat the Lakers and take a commanding 3-1 series lead. Not to go all sappy on you, but this game epitomized why we watch sports in the first place. The odds were stacked ridiculously against our team most of the night, and yet when it was all over, they didn't give up and they stole a game that we'll be talking about until we're six feet under, and well after that. I mean, think about it. You had a sore-ankled Rajon Rondo, whose game revolves around his Ellsbury-like speed. (Like to see those two in a footrace.) You had Kendrick Perkins walking off the floor seemingly holding his shoulder together. You had Lamar Odom (Lamar Odom!) finishing off baskets and wagging his tongue at everyone. You're on the road, which hasn't been kind in these playoffs. The best player on the planet is on the other team. And, to top it all off, it seemed like somebody had nailed a piece of plywood over the C's rim in the first half. Honestly, this one deteriorated so quickly that I was watching U.S. Open golf highlights during the first half, and how many people do you know that went to bed? My college roommate tucked in early, and said his 8-year old son told him Friday morning that "they won." "Who won? The Red Sox?" "No, the Celtics." "What?!? No way..." That conversation was probably pretty common. This game once again showed why this current C's team is just that -- a team. Beginning with the Atlanta series (seems like eons ago), then through Cleveland, Detroit, and now LA, think about how many bench guys have come up big at certain crucial times. James "Pocketful of" Posey. Eddie House. P.J. Brown. Hell, I can even remember Sam Cassell connecting on some important shots. As I've been saying all along, one through twelve the Celtics were/are clearly the better team. And now? Well now we've got another potential t-shirt and hat game coming up tomorrow - on Father's Day no less. I've debated back and forth with some pals on whether we want the C's to win it all out in LA, or if we'd be okay if they lost Game 5 and won it at home in Game 6. As much as I'd love to see a championship victory on our home turf (that's the only thing missing from this incredible run), I'm also fully aware that you have to kill Kobe and those guys while they're down. That's an easy one. 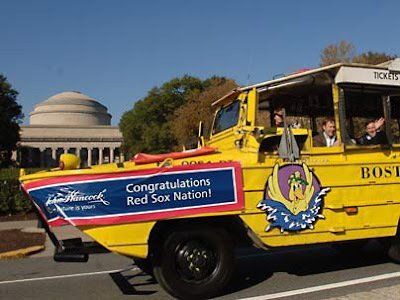 Get the Duck Boats gassed up. For all intents and purposes, tonight's the Big One in this series. 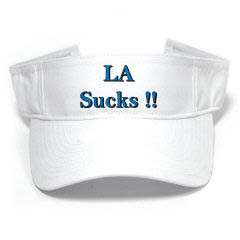 A Celtic win puts LA in a tough hole; a Laker win results in a complete momentum shift, with another game in Botox-land. It's as simple as that. In terms of storylines - and we'll get to the whole referee mess in a minute - there are plenty. Most seem to believe that we won't see another 8 for 35 combined from the field for KG and Pierce. I concur. Shank Shaughnessy actually pens a pretty decent article this morning imploring KG to work more inside. He's been nailing his mid-range jumper throughout the playoffs, but he was cold the other night. But when you look at the Laker bigs - namely Gasol and Odom - it's hard to believe KG can't assert himself more in the paint. I think we see a return of the jumper falling tonight, mixed in with some slashing to the net. As for Pierce, we'll settle for half the guy we saw in Game 2. You also have to wonder about the fatigue factor, flying to LA, etc. Hopefully a little rest does these two some good. Rajon Rondo is another question mark. He rolled his ankle pretty good the other night, and spent most of the remainder of the evening wearing warm-ups and watching Eddie House fire away. He told the media that he's ready to go for Game 4, but we'll see how much it affects him. Kendrick Perkins is on record as saying that Rondo's the key and I agree wholeheartedly. When he's penetrating, dishing, hitting that baseline jumper, and agitating the other team's ballhandlers, the C's win. Next topic: Sasha Vujacic. Damn, he killed us the other night. Bet Doc didn't dream that he'd have to put some specific thinking into how to stop this dude. He's been the balance between the disappointing performances so far of Gasol and Odom. I'll just reiterate here what I've been saying to a few buddies all along. Personnel-wise, from 1 to 12, this Boston Celtics team is flat-out better than this Lakers team. I truly don't think there's much room for debate. It's up to Doc and the C's to make that play out in the end result. Ok - now turning to the giant elephant in the room. First off, who would have thunk that bumbling Bud Selig would show more command and balls in a time of crisis than David Stern? I understand that the stakes are incredibly high and Stern has to reject everything Tim Donaghy says. 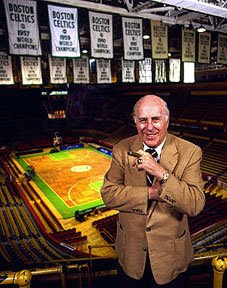 The NBA is his baby and it's surely done well under his watch. But the commish must know that at the very least, he's got a huge perception problem on his hands with the credibility/integrity of his refs. In my humble opinion, he's doing himself and the league a huge disservice by not staying out in front of this and offering solutions. Maybe he takes a different tack when the Finals are over. And with that, one more note on tonight's game - the focus on the refs in the last few days should help the Celtics. Will there ever be a more scrutinized group of officials than the ones who will ref the next few games? After having to wait almost three full days between Games 1 and 2, it's nice to have another game tonight. The universal opinion of most "experts" is that the calls and bounces go the Lakers' way tonight, and Kobe ends up going 27 of 28 from the foul line. While I do agree to some extent, I'd simply point out that you have to get to the basket to get the whistles. To my untrained eyes, it looks like the Celtics' D has figured out how to frustrate slashers like LeBron and Kobe by clogging up the lanes. No matter what happens the rest of the way, take this one to the bank: defensive guru Tom Thibodeau will be a head coach somewhere next year. But back to the very exciting present. The Celtics are in the drivers seat with a 2-0 lead, and really, all they need to do is win at least one of the three games in LA. Even if it's 3-2 heading back to Boston, you have to like the C's chances. That said, I hope they go for the jugular and try to end this thing out in Hollywood. * And while we're on the subject of pricks, I also didn't realize the full extent of Kobe Bryant's douchebaggery. For some proof, believe it or not, we turn to blogger Curt Schilling, who filed this report from courtside during Game 2. Some interesting tidbits on Kobe and KG. * I enjoy reading Bill Simmons just like the next guy, but his latest missive on his experience during Game 2 was even "too much Boston" for me. * Sticking with the media for a moment, think the Globe regrets its decision to let hoops writer extraordinaire Jackie MacMullan go? Now we have to read Shank Shaughnessy's tired act. * Was that not the most obvious travel you've ever seen the other night, when Vladimir Whatever quick-stepped his way from the foul line to the basket? I mean, my friggin' wife was giving the traveling sign! * Here's hoping the high-wattage celebrities come out to play for this one. I've had my fill of Donnie Wahlberg, and various Pats and Red Sox players. I hate to say it, but I need my dose of Jack. * And last but not least, because I don't work and don't have a family to worry about, I'm going to attempt a little live-blogging tonight during the game. Come check it out and leave comments throughout the game. C'mon - it'll be cool. Really. And the beat goes on here in the Hub of All Sports. Since we last chatted, nothing much has happened - unless you count Paul Pierce being wheeled off the court in a wheelchair in Game 1 of the Finals at the Garden, Coco Crisp igniting an all-out brawl against the Rays across town at Fenway, Manny and Youk going at it a bit in the dugout during the same game, and the C's going up 2-0 last night on the Lakers, who suddenly find themselves in desperate straits - as nothing much. The Coco thing had been simmering from earlier in the Rays' series, when he slid into second on a steal and the shortstop was covering the bag with his leg. Evidently, this is one of those no-no's in baseball etiquette, and Coco let everyone within earshot know about it. He then chose to take matters into his own hands, and almost decapitated Akinori Iwamura later with a hard slide into the bag. It was definitely a slide with a purpose - the only problem is that it wasn't Jason Bartlett, who had angered Coco on the other play. This got the Rays pissed off, and on Thursday night James Shields decided to plunk Coco with his second pitch (he missed him on his first try). Coco knew it was coming, paused a moment (he said to 'get the catcher off him a little bit') and then charged the mound. Shields unleashed a huge right hook that Coco miraculously ducked away from - and thank God, because he would have been seriously hurt. Shields is a bid dude, swinging downhill. After that, Dioner Navarro had Coco wrapped up on the ground, and a couple of cowardly Rays took multiple punches, most notably Jonny Punkass Gomes and Carl Crawford. Suspensions will be forthcoming. As for the Manny-Youk flare-up, it was originally speculated that Youk was all over Manny because the dredlocked one was quite late to the pile at the mound after Coco got smothered. It came out the next day, however, that some players have been on Youk this year for his antics after striking out or making an out. The Sox could be up 10-0, and if Youk K's on what he feels is a bad pitch, you'd think he just got word that his dog died. I can see how some players feel it makes him look selfish. We'll see if there's any improvement in the histrionics. And finally, keeeping with the Sox for one last moment, they swept the Rays and then bid them good riddance for the lowly Mariners this weekend. Sox took 2 out of 3 from Ichiro & Co. and have leapfrogged over the Rays for the division lead. Off day today and then back into action with Baltimore at Fenway tomorrow night. Okay, onto the NBA Finals, where the Celtics have built up a shocking 2-0 lead on the heels of their tenacious D. The first game was pure drama, with Pierce getting hurt early, being carted off in a wheelchair and then bounding back onto the court moments later as if nothing had happened. 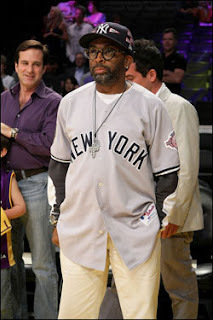 The Lakers - particularly Phil Jackson - were dubious, but here's my take. Pierce has waited 10 years for this. He heard a pop in his knee. He was scared, and they took every precaution possible. Sure, it looked embarrassing as hell - but in the end, who cares? Of course, if that was Kobe, we'd be all over him so call me a hypocrite. Naturally, Pierce led the charge in the fourth quarter of Game 1 and he was on his game last night as well, even after a couple days of wondering whether he'd play. He was nailing threes and driving to the basket, but it was Leon Powe (rhymes with 'eat CROW' Phil Jackson) who was the hero of the night in Game 2. Powe - who was banished to DNP-CD status for much of Rounds 1 and 2, was fully unleashed last night and he showed off his strong inside game. In the end, Powe finished with 21 points, and as Jackson pointed out in the post-game presser (after mispronouncing his name) Powe shot more free throws in 14 minutes of play than the entire Lakers team did all night. That, my friends, is downright startling and you can bet it will change in LA. If you're into that sort of thing - betting, that is... you might be inclined to place a Mike Donaghy Memorial Wager on Game 3 because Kobe will be reacquainted with the charity stripe many times in Game 3. Bank on it. 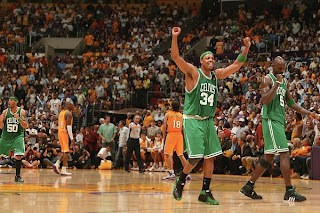 Even if you don't root for the Celtics or the Lakers, how can you not be fired up for this series? It's obviously got the history angle going for it, but more importantly it's the best offensive team going against the best defensive team. This is the 2007 Patriots going against the 1986 Bears. I ain't no analyst, but let's look at the personnel. The Lakers will start Lamar Odom and Vlad Radmanovic at forward, Pau Gasol in the middle, and Kobe and Derek Fisher at guard. 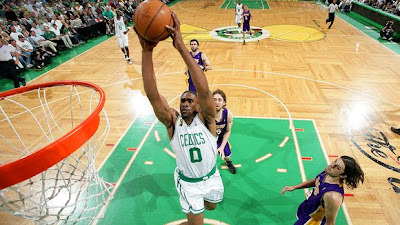 For the Celtics, it'll be Garnett and Pierce at forward, Perkins at center, and Ray Allen and Rajon Rondo at guard. Kobe's going to get his, but it will be interesting to see if Doc unleashes Pierce on him like he did with LeBron in Round 2. I don't think we want to see Ray Allen guarding Kobe. The rebounding battle between Perkins and Odom will also be very interesting to watch. Just going by the talent alone on the floor at the start of the game, it seems like the Celtics have the edge. Lakers have the edge in coaching, and maybe give a slight edge to the Celts' bench. So I guess it'll be C's in 4. And of course, it won't be. This one's going the full 7 - a view I feel even stronger about after hearing Bill Simmons say on the radio today that the NBA makes $80 million per Finals game. Not to suggest that there's anything sketchy going on here, but would you not be surprised to see the refs maybe calls things a little differently as the series evolves? Let's hope when it's all said and done that we're talking more about great plays and players than about referees and blown calls. Enjoy. You know, I've thought a lot lately about how easy it must be for "professional" sports media types here in Boston to do their jobs. I mean, the radio shows and columns just kind of write themselves on a daily basis, don't they? The Pats going 18-0, the Super Bowl, the Celtics with the biggest one-year turnaround in NBA history, Spygate, the renewal of the Celtics-Lakers rivalry on the big stage, Manny's 500th... and now 501 and 502... it's truly a non-stop carousel. The latest addition to the sports news shuffle isn't a very uplifting one. Over the weekend in Baltimore, David Ortiz swung at a pitch and felt a pop in his left wrist. An MRI yesterday showed that he's got a torn tendon sheath (look it up on WebMD), and projections have him out of the lineup for at least a month. It's never good to have the big feller out of the lineup period, but this timing hurts because Big Papi was just heating up after a slow start, and he was starting to foil the right-field shift a lot of teams employ by going to the opposite field. Still, the Sox are obviously doing the right thing by proceeding with caution. They're saying surgery isn't an option, but with a guy who makes his living with some powerful flicks of his wrists, it's not the best injury to have. For the time being, we'll probably see lots of Manny at DH which allows Francona to field a better defensive outfield of Ellsbury, Drew and Crisp. Also look for a Brandon Moss call-up. Moss was getting into a groove here a while back before he had to have an emergency appendectomy. He's killing the ball again down in Pawtucket. The Sox are finally back home tonight, with a 7:00 start time against the team they're chasing, believe it or not, the Tampa Bay Rays. Justin Masterson - who's pitched two beauties in spot duty this year - gets the ball for the Sox. Matt Garza for the Rays. As if we aren't blessed enough around here with our sports teams, the Celtics did it the other night - beating the Pistons on their home turf to win the East in six games. Next up: a hugely delicious championship series against... are you sitting down?... 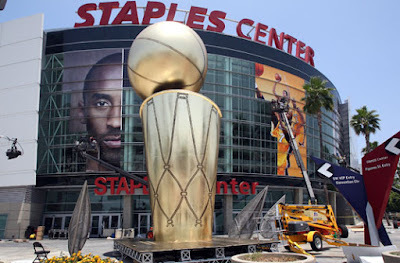 the Los Angeles Lakers. Once again, the two best teams in the Association are the Celtics and Lakers, and the stars have aligned to put them in the Finals for the whole world to see. This is gonna be fun. As we sit here on a beautiful Sunday morning to begin the month of June, you just know the Globe and the Herald are busy preparing special Finals sections. Get ready for an absolute onslaught of Larry Bird, Magic Johnson, Kareem, Gerald Henderson stole the ball, McHale clotheslined Clark Kent Rambis, Jack Nicholson, the heat game in the '84 finals at the Garden, Wilt, Russ, Auerbach, West, Johnny Most, Chick Hearn, Hollywood vs. blue-collar Boston. It's going to be loud, it's going to be frequent, and I wouldn't have it any other way. The other beauty in all of this: the only way I've been able to convince my wife to watch the games (she hates basketball because of all the foul calls - smart girl) is to see some of the big celebrities in the good seats on high-definition. The other night it was Ellen Pompeo from Gray's Anatomy and that went over big. So this is going to be heaven for both of us. I'll be back with a post on matchups, but for now, I think we all need a little basketball break. Game 1 is Thursday night at the Garden with a ludicrous 9:20 start time.